Lovey Photography – From May 2015 – March 2016, Sherry and Sean traveled the country and lived in a 5th wheel R.V. They took pictures, hiked mountains, and saw amazing sights. They are now settled in Fort Myers, Florida and are continuing to take pictures and seeing amazing sights. This is the blog of their journey from leaving St. Louis and starting an adventure, to living in Florida and doing photography. Enjoy the stories, and leave comments if you have one to share! Well, it has been a full year since we set out on our Adventure! Sherry and the pups at our stop in Onawa. From the beginning, we had planned this to be a one year…possibly longer adventure. During our travels, we truly came to appreciate a few things that are so easy to take for granted. First, we had hoped to discover some of the beauty this great nation has to offer. We found that and more. The more we saw, the more we wanted to see. Gorgeous view our first night at Grandview. So, Southern Florida, we do like it. Going to the beach and watching the sunsets, collecting shells. Amazing. Before I continue, if we are sticking to our adventure plan of identifying the place we would consider a ‘forever home’, Montana still tops our list… except for snow and cold. IF it had beaches and no snow… Well, we would be there in a heartbeat. 🙂 Back to Florida. Over the last two months we have been incredibly busy getting to know the area, moving into our apartment and a multitude of other things. Sherry’s parents loaded up a huge Penske truck with our items in storage back in St. Louis and drove down to visit us for a while. This brings us back up to point 2 above. We put a lot in our apartment and a lot more in the Garage that we have as a part of our lease. You know what? We didn’t miss much. We joke that the dining room table, Dyson vacuum and Kitchen Aide mixer were the only things we really thought we needed. So, we are taking some time unpacking boxes and then re-loading some for donations. We just dropped off a few boxes for a family at Sherry’s school who had a house fire. In other news, we are now a two scuba diver family. A month ago we were planning our summer travels and Sherry decided she would try to get certified so she could be Sean’s buddy. We found a local dive shop, bought her equipment and set up lessons. She passed with flying colors! Sean was very excited and happy he could go on the open water dives to take some photos. 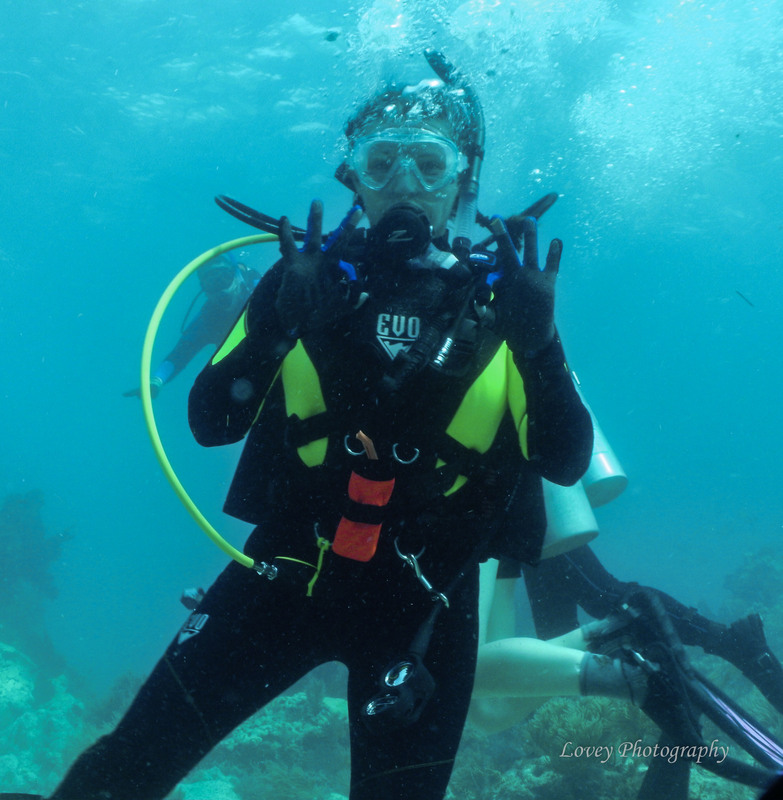 Sherry was a real natural and found she loved scuba. Her open water dives were off Key Largo (some of the best diving in the world). While in the Keys, we had to go to one of Sean’s favorite hangouts – Sharky’s. They make some of the best Mojito’s on the planet and the Cuban Sandwich is amazing! Our first night in Key Largo, as we stood on a balcony, Sherry said she could see why Sean wanted to retire to the Keys. 🙂 Sailboat????? We are looking ahead to our next dive trip, hopefully in a month. Winch, in the Winch Hole off Key Largo. We will continue our blog entries as we explore Florida, both above and below the waves. To all our Full Time friends, stay safe and enjoy your travels. We will be back on the road in a few weeks to enjoy some summer adventures before Sherry has to return to work. It has been 10 months since we sold it all, loaded up our Heartland Bighorn, and hit the open road. We started out on May 31, 2015 with a plan to see things that many people do not have the opportunity to see. We wanted to spend quality time in national parks, beautiful locations, and unique landscapes. Although we still have many items on our bucket list, we are amazed at what we have been able to do and see. Sean standing by a second Keelboat on display in the museum. Crazy Horse Monument. This was taken from the ‘arm’ of the monument. The famous Wall Drug Store. Love the donuts, pecan rolls, coffee…. There’s Sapphires in them thar hills!!! Vance, Chris, Sherry and Sean at Pecos Flavors. Writing Merry Christmas…. Does SHerry know the tide is coming in??? Sadly, our full-time adventure will be over on Friday, as we go sign the lease for our new apartment. Sherry likes working in the school district, and we have decided to rent for a year to make sure we truly love living in southwest Florida. We have nothing but respect for our fellow travelers who are full-time on the road, some for years. Our decision to resettle has to do with the nature of teaching. It would be difficult to travel and teach, and we have to admit that we are craving the consistency that four solid walls bring, and the security of a job with benefits and retirement for Sherry. (If you haven’t kept up with us from the beginning, read our “about us” to understand why we started this adventure in the first place). We aren’t for certain that southwest Florida is our permanent new home, but we always said this was an adventure about taking chances and saying ‘yes’ to opportunity. Actually, the biggest take away from this adventure for us has been that we have to let life happen to us. We have so many examples from this adventure that explains this idea. We took a workamping job in Montana on a whim, and it was the best thing we did on this adventure! We highly recommend Northwest Montana and Glacier National Park. If Florida doesn’t work out, Montana is calling us back. We came to this area of Florida in the same way. We said yes to an opportunity, and the doors just kept opening. As soon as we got here, Sherry went to the education job fair and was offered a full-time job on the spot. Tomorrow isn’t guaranteed, so we figure we should make the most of whatever comes our way. We have talked a lot recently that we cannot forget the lessons we have learned on this journey. 1. Experiences NOT things: you can buy many things in life, but the memories you make by DOING will always be more important than the stuff you buy. 2. Spending time together makes you a better couple: we have said this MANY times – people always ask if we are tired of each other yet. We think that the time that we’ve spent traveling and being together 24/7 has made us a better couple, not worse. 3. Say yes: we already went over this, but it is a good lesson. We would ask each other if we wanted to go somewhere, do something, see something, and we would always say ‘yes’. There’s a lot of life out there. Go experience it! Even if it is just in your own backyard. We were talking the other day that we have been in Florida for a few months, but we haven’t gotten out to explore enough. Work and doing other things have taken our time away from what we have said should be more important – experiences. So, as we clean out the RV, store it, and move into a new home, we are going to remember what we have learned by living full-time in an RV. But don’t worry, the adventure isn’t completely over. Being a teacher, Sherry has the advantage of having weeks at a time off in the summer and for various breaks throughout the year. We will be heading to the Keys this summer, and on Sherry’s bucket list is the Dry Tortugas National Park off of Key West. We will continue to blog and share our experiences with our readers. We hope to get our photography business booming here in Fort Myers, so we will definitely continue blogging about that. Take care, fellow adventurers! Carpe Diem and all that! 8 Months… Heating Elements, Zoos and Snowbirds. Well, let’s start this entry with an unexpected topic: using your furnace in Southern Florida. 🙂 Yes, we were faced with that need several nights the last few weeks when temperatures in Fort Myers reached the upper 30’s and low 40’s at night. Cloudy, damp and cool… Who knew we would run into the need for our furnace in the heart of Snowbird country where the average temperature is in the 50’s at night and 70’s during the day? OK, we aren’t that naïve, we did expect to have some chilly times, but the thought of turning on the furnace simply galled us. LOL. The solution? Something Sean has been debating since before we started our adventure. Our 37′ Bighorn has two Dometic air conditioners in addition to the propane furnace. Like many rigs with two air conditioners, one or more has an ‘optional’ heat ability. Our bedroom unit is a Dometic DuoTherm model and has that optional heater ability. Other common models (Coleman) also have the heat option. Essentially, the heat option is an electric heating element that is installed at the air intake and warms air as it circulates into the room. Sean did a lot of research and decided, before we left, that it probably wasn’t worth it. Since then, we have had several chilly nights where it would have been nice to not use the furnace. On the positive side, we enjoy the room being chilly and often sleep with the fan running. We also like to cuddle, so a little cold is usually no issue. Back to Florida… When our furnace kicked on, we hauled out our portable radiator and were OK, but we were putting it away during the day, taking it out at night… So, back to the research. Plenty of positive and negative reviews on adding the heating element and very little in the way of images or clear directions. Sean decided to find a heating element, install it and see how it worked. Believe it or not, we couldn’t find one in st0ck at any of the local RV stores. Sean did find one on Amazon that would qualify for one day delivery. The directions that came with the element were adequate. We couldn’t find any photos or videos about the installation online (we are solving that issue with this post). All that aside, installation was very simple. How did it work? Our coldest temps were in the upper 30’s and we found the bedroom unit did an excellent job warming the entire rig (72 degrees). We even had to turn it off at night and run the vent alone as it made the bedroom too warm, even with the door open. Our review? Five stars. It is more than adequate to heat a 37′ RV when temps stay in the upper 30’s or higher. The only drawback? The DuoTherm Unit is steady on, no thermostat control. That aside, we wish we had done this months ago. This is the plug for the heating element cord. The heating element has been plugged in. The heating element already installed. It is to the left of the control dials. We visited the Naples Zoo a few weeks ago and found it a well appointed and run zoo. We have been spoiled by the St. Louis Zoo in Forest Park and have to stop comparisons. At the Naples Zoo, you could feed the giraffes, take a boat ride to see monkeys living on islands in man-made Lake Victoria, and many other animals enjoying the outdoors. It was a nice change to see animals living in open air environments because the weather is adequate for them. The morning we went, we were treated to the verbal territorial cries of two white-gloved Gibbon’s. The sound echoed throughout the entire park. We also saw our first Gators since arriving in the state. Seriously, we have three small ones in one of the lakes at the resort we are staying, but have yet to see one. We call our schnauzer, Maggie, a Honey Badger. This description suits her. It was a little chilly this visit! Since arriving in Fort Myers, we have seen the population increase dramatically. Local RV parks and resorts are booked solid, and many have been since mid summer. We have also witnessed two phenomena we really haven’t seen much in our travels. The first is purchasing RV sites for extended stays. We heard of people doing so, especially in Southern climates, but had no idea how rapidly the concept is spreading. There is a push in most RV parks in this region to sell rather than rent. It has led to an incredible shortage of spaces for the traveling RV’r who wants a stop for a few nights or a week. Our second phenomena is the RV’r who has a single destination. 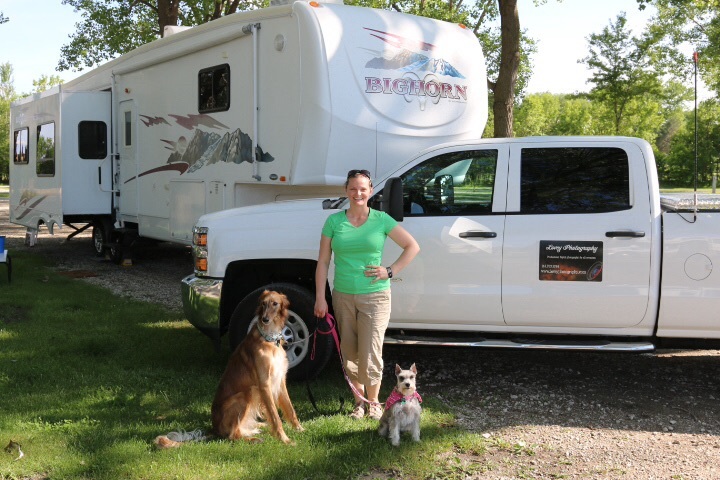 We’ve seen many couples who leave their RV on site and fly in and out of town or those who purchase an RV and have it professionally driven to a location where it sits for years. Many of these people are those who buy a site. Interesting, no judgements meant or implied. We had come to realize our full time experience was quite different from others. We like staying in one spot for a while and exploring while others like the road and traveling. We also know our year long adventure is wrapping up, at least in it’s current form and new adventures await us. Will we be ‘full time’ travelers? Probably not, at least not for many more years. We will continue to travel. We do love our “condo on wheels”, and we have many new places to see. We also have new friends and old places to revisit. In the end, isn’t it all about freedom? Love of seeing something new? Gathering experiences rather than things? As we think about it, that is probably our ‘definition’ of a true RV’r. One who gathers experiences. What is yours? A funny thing happened on the way to Florida…. First – Merry Christmas and Happy Holidays!!!!! We apologize for the lack of posts the last month. It isn’t that a lot hasn’t been happening. No, far from it! In future posts we will cover our mad dash from New Mexico to Dallas, where we had Thanksgiving with Sean’s daughter and son-in-law and were able to catch up with other family. On the way we stopped and visited the Cadillac Ranch, weathered a crazy wind storm, crazier rain storms and terrible roads. On leaving Dallas we raced across to the Florida Panhandle where we spent a day getting Florida registration and license’s. Then it was off to Ft. Myers where we had a work camping job lined up. That almost brings us to the title of today’s post. 🙂 If you have been following our blog you know we planned for a year on the road. We have also been pretty good at adapting to changes on the road and living life as it happens. Our first day at the new long term spot. So, our original plans included wintering in Florida till April then traveling again, probably up the East Coast. We felt Florida might eventually be a permanent home for us and Sherry had been researching teaching jobs in the Keys and Homestead areas. She was going to substitute teach through April and we would see if a job happened. Well, when we accepted the work camping position Sherry put in applications to sub in the local district. On our drive to Florida she received several e-mails from the district and was asked to bring her papers to a job fair. The fair was scheduled the day after we arrived. Well, we drove to the main office, Sean dropped Sherry so he could get a haircut. Twenty minutes later, Sherry was texting that she had been offered a full time position teaching Honors Language Arts at one of the local High Schools!!!! Crazy, we discussed it and she ended up accepting the position. From an ethical perspective she couldn’t turn it down. This course had been taught by subs for the first half of the year and it just didn’t seem right to not take it on since it was right in her specialty. So, will we stay here? Over the last month we have found so much we love about this area. But, in keeping with our philosophy of taking life as it comes. We have decided to see how the job goes and make a decision this June. Decisions, decisions! Oh, we have both been sick since arriving in sunny Florida! Go figure, two days after arriving Sean was laid up for a week with a temperature and congestion. Then Sherry got it. Fortunately, she only took a few days to recover. A good thing, since we decided to treat ourselves to a stay in Orlando and visit Disney to play and see the Christmas shows. Yes, our last post was our 6 month post. Well, really our 6 month video post, but we knew when we put it up that we also wanted to do a text post and we are at least three weeks behind on stops. 🙂 So, let’s start with the 6 months on the road. We’ve said this before, but our original plan had always been to spend a year traveling the country and then settle down somewhere. Sean has always loved Florida and is an avid diver. Sherry loves warm weather and Florida, so Florida has always been our number one potential landing spot. Our travels have made us add possible ‘permanent’ locations such as Montana near Glacier National Park. We had always planned on spending the winter in Florida then using the last few months of our ‘year’ to travel up the East coast. Well, even the best laid plans can change, and we have prided ourselves on saying we will take life as it comes and enjoy it. While in Nevada, we were contacted by an RV park/resort in Florida to stay for the winter and join a team of work-campers. The RV park is gorgeous and right in one of our primary ‘settle down’ locations. Sherry had been looking at several spots for teaching opportunities, and this area was top on the list. It is also in a great location for diving. Hmmm. Well, we shouldn’t put the cart before the horse as they say. We did accept the position, it too good to pass up. Sherry will be looking for teaching positions, and we will see what happens. We have talked a lot about how much we enjoy this life and how hard it would be to change things up and get ‘normal’ again. The worst part would be not being around each other 24/7. Yes, seriously, we love the time together and would miss it a lot. So, at 6 months we are loving what we are doing but also contemplating more change. We will see. We have also laughed and said that if the ‘worst’ case is we continue to travel then ‘Oh Well’. One final thought: as we write this we are sitting in Destin, Florida. Technically, we have come full circle because for spring break this year in March we came to Destin to ‘test’ our lifestyle before selling our house. When we arrived, this time, we did a quick set-up and then drove to the beach. It was calling to us! Just a few minutes on the sand, staring at the ocean was incredibly cathartic. We talked about our journey from ocean to Mountains and all the land in between. This is truly a beautiful country and we are immensely lucky to have discovered a good part of it. Who knows what the future will bring. Carpe Diem! Now, about Alamogordo. While staying in Roswell, we were looking for other places to visit and decided Alamogordo would be perfect. It was only a few hours away and we both wanted to see the white sands. Wow, we are so sad that we didn’t have more time to stay! After a drive across one of the central mountain ranges in New Mexico, we were soon at our new RV park (Boot Hill Resort – GREAT park and location!) and able to see the sands a little less than 20 miles off. We unhooked and drove off to see what we could see. Driving up to the White Sands monument we were amused to see signs that said the highway may be shut down during missile testing. That was new for us. There is a single road into the park that led off to the dunes in the distance. It was remarkable to watch the desert scrub gradually disappear to be taken over by… well, white sand. It looked so much like snow and snow dunes that we were caught up in the weirdness of a warm day and what appeared to be snow. In fact, we were really caught off guard when we rounded a corner to see a sign say the paved road ended. The road continued, but was now plowed sand. Wow, so much like a Midwest snow scene…. Minus the houses, trees, well, you know. Then, we saw fellow explorers and kids using ‘snow’ sleds to slide down the face of several dunes. Too much fun! We drove as far as we could, got out and walked through and on some of the dunes. Sherry just loved it and we quickly decided to come back the next day and take some photos. Since Sherry models on the side, we made it a glamour photo shoot. Amazing scenery. While in Alamogordo, we also went out to the Space Museum, saw the worlds largest pistachio, drank some wine, and realized we had to come back. There is so much more we want to see and explore in this amazing place that we have moved it up our list of must return places. So far: Montana, Alamogordo and the Grand Canyon…. Hmmm, regardless of whether we give up the ‘full time’ life, we still have so much we want to see, but we are truly grateful for what we’ve done so far. After leaving Alamogordo, we had a quick dash across the state and into Texas. We had plans to spend a few weeks in Dallas and see Sean’s daughter and son-in-law. We stopped a few times; one stop in Amarillo was extended a day because of winds over 40 MPH and gusting to 60 MPH. Crazy! We used the time to catch up on work and also visit the Cadillac Ranch. We have more videos coming, so stay tuned for more updates on our 6 months on the road series! We hope everyone had a wonderful Thanksgiving! Happy travels!